I really like Nigel Slater’s writing. His book “Food Diaries” is well worth getting out of the library. There’s not much vegan food in it but he’s a great writer and has an infectious love of food. This dish also appeared in the paper and was recommended to me by meat eating friends. 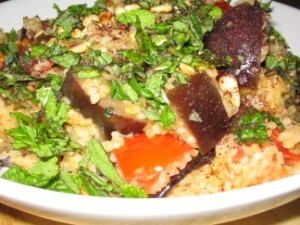 I don’t cook the bulgar wheat as long as he does, and I sprinkle a little sumac over the top too. It just seems to go well with the rest of the flavours in the dish.